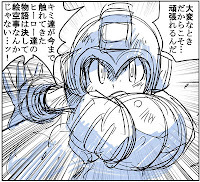 After months of silence, Hitoshi Ariga, author and illustrator of Mega Man Megamix and Gigamix manga, returned to the blogosphere -- a return brought on by a sense of duty in light of Friday's catastrophe in Japan. As a man who's spent much of his career drawing heroes, Ariga felt compelled to publicly share his condolences for the earthquake/tsunami victims, saying that the country bared witness to the rise of many heroes -- people, everyday people, being heroes in the hearts of others, especially in the hard hit areas of Japan. Yet, there are some who found solace from the likes of fictional heroes -- heroes such as Mega Man. A young fan named Aya Takeshi sent Ariga a message following the events of Friday, saying he found comfort from Gigamix, more so, Mega Man himself. Inspired by the actions of the Blue Bomber, a selfless hero who fights for the weak and refuses to bow to the whims of injustice, Takeshi expressed his desire to protect the future from similar catastrophes. Ariga was, for lack of a better word, touched. Takeshi's words helped Ariga escape a depression bought on by the destruction that ravaged much of Japan. Inspired, Ariga's asks those able to help those in need during these dark days; protect the young and old, help in whatever ways possible; become a hero in the heart of another. It is through through these selfless acts, he believes, that true progress to rebuild the nation can begin. Realizing there are many people in Japan in need of a distraction, Ariga has chosen to hold a coloring contest with Megamix and Gigamix postcards as prizes. Though not explicitly stated, the contest appears to be aimed at children who need something to do to in order to stay occupied -- an escape from the harsh reality that surrounds them. Children can choose to color from three hi-resolution lineart images of Rockman Remix's front and back cover, each with a varying degree of difficulty (Easy, Normal and Hard Modes). You can check those out in the above link. This is, undeniably, an immensely generous gesture on Ariga's part. Overseas fans cannot (and probably shouldn't) participate, however, it's an event that's worth some mad props, regardless. Even in the bleakest of days, Mega Man can still remain someone's hero. that is so sweet. ariga is an awesome guy. I'm so relieved to finally hear some word on Ariga. I've been worried about his safety. What beautiful hearts Aya Takeshi and Mr. Ariga have, for their desire to help the people find hope and comfort in a land so devastated by disaster. It's absolutely amazing what Mega Man can inspire... such as wonderful things like this that are great to know about. Very kind. Ariga is, indeed, awesome, and it's good to hear he's safe. Anything about Keiji, though? I'm proud to know that a guy this awesome is the writer of the best MegaMan manga ever. I wish I could extend my admiration to him. And I'm glad that MM had a positive part in this incident, even if it's just a small one. Don't forget to donate, people. As for the contest, it is good to see clean art of the Remix front and back covers. The kids will sure have fun with them. Good luck to all! Ariga is a pretty cool guy and doesn't afraid of anything. 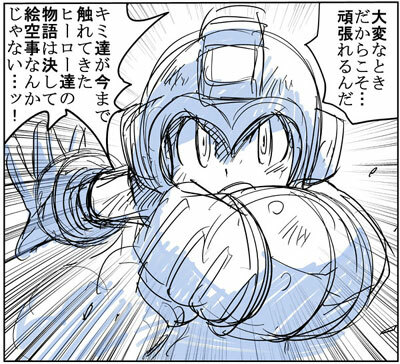 I can't think of anyone better to represent Megaman on the Manga front. That is just awesome. Kudos to Ariga. All wishes to Japan. Let's help Japan out!!! To those wondering about Keiji Inafune, he's okay too. He had posted on his blog that he's fine. @Dr. Jerk: Oh, thank goodness to hear that. Wow he's really a good guy you see in his face and he knows what can help the others in depression good luck too him and hope that the whole country recover quickly. Hes like angel an amazing guy is he, good luck on hes works and the project that hes making. "A hero... is just a man... who knows he's free..."